Forget the courses and seminars on leadership. Save your money and don’t bother attending the newest lectures on effective management. Instead of that latest best-seller on how to influence others, open your Bible to Nehemiah. Its thirteen chapters give a crash course on effective leadership. You will not find any easy flow chart telling you the steps. You will look in vain for quick one-liners which motivate and galvanize a company. His secret lay in a different area and in an often unappreciated realm. While his burden was in the spiritual realm – as ours is – yet the principles which he displayed in his leadership are admirable in any sphere of responsibility, whether spiritual or secular. Nehemiah’s story begins with a clear insight to what is indispensable: his genuine interest in people. This cannot be faked or pretended. It is soon exposed if it is. Nehemiah had a deep burden for the welfare of the people and the city. His reasons were that they both belonged to God and were to be a testimony to God. His interest was not in the people of God because they reflected his leadership and would be either a credit to him or a discredit. He was not a leader at this point. His motivation was so great that he wept (ch 1:4) and was willing to sacrifice the normal routine and comforts he knew for the sake of them. He fasted and prayed (v 4-11) and was willing to use his career as a springboard to help the people of God. The first essential then, for effective leadership, is a genuine commitment to the people of God and the honor of God’s name. Self-interest, personal agendas, power thirst – all of these will soon sour under the heat of testing which will come. Like the honey banned from the meal-offering, it has no fragrance when the fire is applied. Some may wonder why the list of names of those who came up in a previous day is repeated in Nehemiah 7. Is there not a suggestion here that Nehemiah appreciated the labor and sacrifice of those who went before? There is no censuring of a past generation as being responsible for the present condition. He is willing to identify himself among those responsible for the current distress (ch 1:6, 7, 10; 2:17). His unseen sacrifice in the palace in chapter 1 is now followed by a life of sacrifice as he moves among the people of God. He refuses to live off the people (ch 5:14-18), but, sensitive to their need and conditions, supports himself and others. He is not a leader barking orders from behind closed doors, enjoying luxury and ease. He is out among the people, enduring hardship with them (ch 4:22, 23). It is as if he knew the instructions that Peter would give a future generation (1 Pet 5:1-4). How vital to identify with the people of God in their trials and burdens! Not only does he appreciate a previous generation, but he is willing to bring others into places of usefulness. He is not intent on being a one-man ruler. 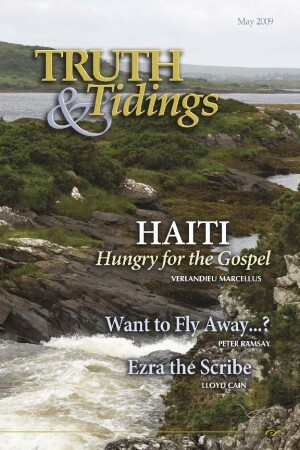 Hanani and Hananiah are involved (ch 7) and Ezra reappears in chapter 8. There are priests, Levites, porters, and others who become responsible for spheres of service. Few words so capsulize this man’s life as “intensity.” The intensity of his convictions is seen when he rebukes the Jews for their treatment of their brethren (ch 5:6-13); when he deals with the problem of separation which had been violated (ch 13:23-27); and when he becomes passionate about the House of God and the priestly portions which had been neglected (ch 13:1-14). He moves with total commitment to the cause God has laid upon his heart (ch 2:12). Wisely, he does not rush into a hasty attempt to stir the people. His own soul is stirred first by the survey of the city; then he begins to bring others on board and share his vision. The ability to enable others to share a vision is a hallmark of a great leader. Nehemiah had foresight and planned ahead. He was not merely reactive but proactive. He had a vision and dream – albeit from God – and prepared to fulfill it (ch 2:5, 7, 8). Organization and delegation are added to his job description as he portions out responsibility to others. He is also a man with insight into the character of others. The hypocrisy of some (ch 6:10), duplicity of others (ch 6:1-2) and insolence of many (ch 4; 6:17) did not deter him. He could see behind and beyond the exteriors and fair words to the reality of their motives. His foresight and insight were wedded as well to hindsight. He learned from history. He learned the lessons the past was meant to teach. Another has said that if we fail to learn the lessons of history, we are doomed to repeat them. Nehemiah was schooled in the history of the nation and knew its downward path and its cause. He knew God in prayer. On thirteen occasions he punctuates the book with prayer. More importantly, on eleven of those occasions, he is able to lift his heart and say, “My God.” In chapter one he learned to weep; in chapter two he learned to wait. He knew God amidst the problems. In every instance he turns to God for strength, or guidance, or wisdom. Moses-like, he “returned to God” whenever need arose. Lastly, he knew God for the pathway. Directions and decisions come from God to this committed man. Nothing moved him and nothing mattered to him other than the welfare of God’s people (ch 2:10) and the testimony of God (ch 2:17).